Nebraska Senator Deb Fischer is Fiscally Irresponsible! Fischer voted for the new tax law which increases our debt by $1 trillion over ten years even after new growth is taken into account. The main features of the new law are excellent but need offsets to avoid losing tax revenue. The budget just approved by Congress and signed by President Trump, for this year and next, will increase the debt by $300 billion. It means that the deficit for FY 2018 will be $800 billion followed by $1.2 trillion for FY 2019 (see first chart). In FY 2027, just ten years away, the annual deficit is projected to increase to $2.1 trillion (see second chart). 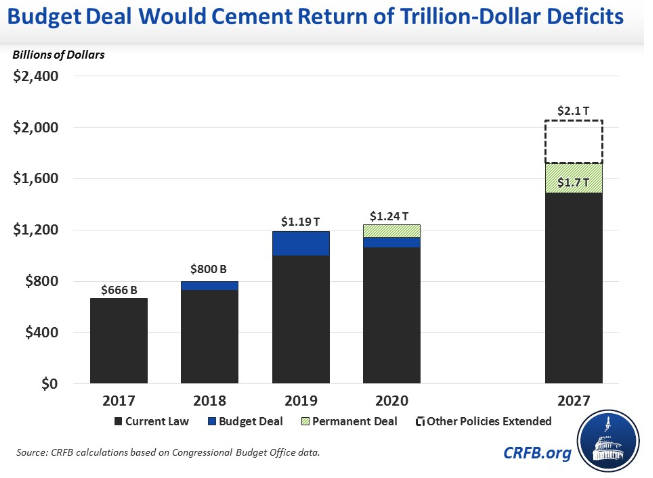 On Senator Fischer’s watch, for the six Fiscal Years 2014 – 2019, the new debt is likely going to be $4.5 trillion (just add up the totals for these years in the chart above). This means that by the end of her six year term in office, 20% of our entire debt of $22.5 trillion, will have been accumulated while she was in office! Conclusion. The national debt now $20.5 trillion and growing rapidly, is by far our biggest long term problem. We badly need representatives in Congress who will stop ignoring this awful problem and start doing something about it. That is why I am a candidate for the U.S. Senate. My last three posts: here, here, and here, are concerned with the high cost of American healthcare and how this is so closely tied in with our very large and badly out-of-control national debt. In particular, three giant American companies: Amazon, Berkshire Hathaway, and JP Morgan Chase are forming an independent healthcare company to try to hold down healthcare costs for their combined one million employees in the U.S. Previous efforts along the same line by Safeway and Boeing have held down costs for the companies own employees but are too small scale to have had broader impact. The new company, much larger in size, may be able to negotiate lower prices from labs and hospitals for its own members. But then these same labs and hospitals will charge more for everyone else. It diminishes incentives to reduce costs by insulating workers from the full price of their benefits. It discourages changes that could displease even a small number of workers, thereby creating incentives to minimize disruption. 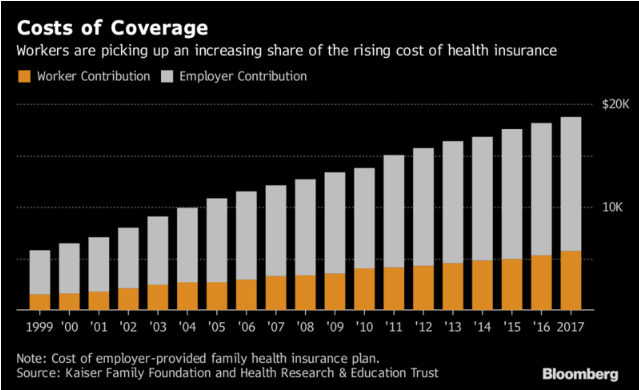 The pervasiveness of employer health insurance makes it more difficult for individuals to buy health insurance on their own, thus discouraging entrepreneurship. Conclusion. Given the inherent flaws in employer provided health insurance, it is unlikely that more innovation by individual companies, or groups of companies, will lead to an overall solution to the exorbitant cost of American healthcare. The solution lies in a different direction: ending or at least modifying the ACA’s employer mandate. See here for details. More later! It is a very good idea to cut the top corporate tax rate to 20% or so from its current 35% level. This will make the U.S. competitive with other developed countries and encourage our multinational companies to bring their foreign profits back home for reinvestment in the U.S. It will also encourage other foreign companies to set up shop in the U.S.
Current national debt, at 77% of GDP (for the public part on which we pay interest) is the highest it has been since right after WWII, and is already predicted by CBO to keep getting worse, without major changes in current policy. When interest rates eventually return to more normal and higher levels, interest payments on the debt will skyrocket. 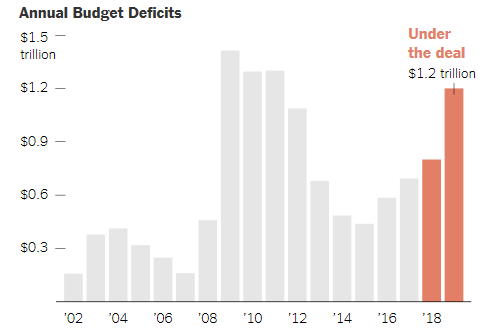 And this will continue indefinitely, eventually leading to a new fiscal crisis, much worse than the Financial Crisis of 2008. Economic growth is finally becoming robust. We now have had two quarters in a row of 3% growth. In 2015 median household income grew by 5.2% with another 3.2% added in 2016. 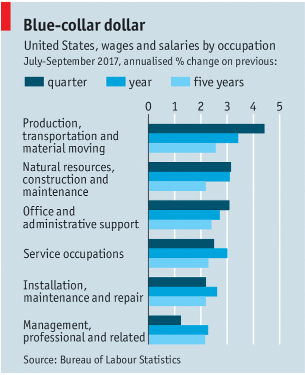 Blue collar wages are beginning to take off (see chart). The overall unemployment rate has dropped to 4.1%. Even the unemployment rate for Americans age 25 and older, without a high school diploma, has dropped to 5.2% (see second chart). Conclusion. The last thing our economy needs right now is the artificial stimulus caused by a deficit-financed tax cut. It is likely to overheat an already hot economy and thereby ignite inflation which will force the Federal Reserve to raise interest rates much faster than would otherwise be necessary. The American economy is in basically good shape with a low unemployment rate of 4.2% and the likelihood of somewhat faster growth in the near future. Income inequality and poverty are real problems, see here and here, but there are reasonable and effective ways to address them. Rapidly accumulating debt is by far our most critical unsolved problem which is all the more frightening because our polarized political system does not seem capable of addressing it. The Bureau of Labor Statistics has just released its projections of what the U.S. economy will look like in 2026. 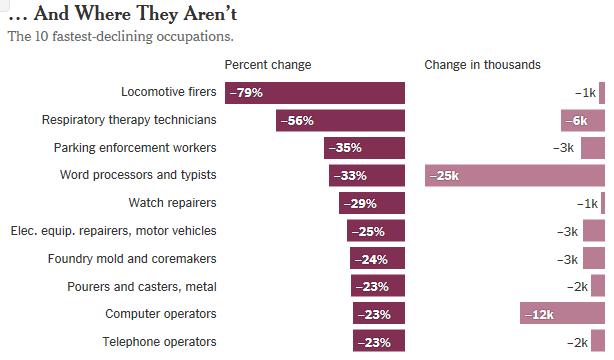 More dominated by the service sector amid the continuing erosion of manufacturing jobs (see two charts below). 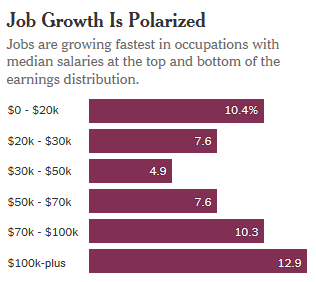 More polarized in both earnings and geography (see top and bottom charts). 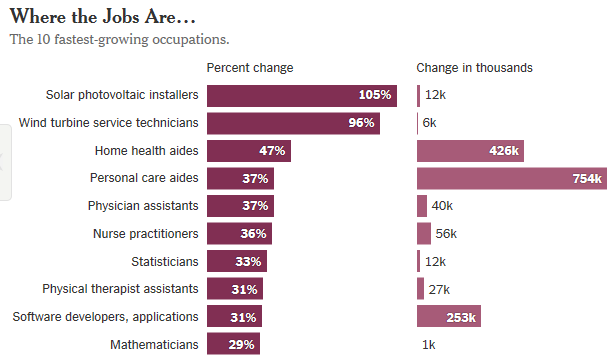 More tilted towards jobs which require at least a bachelor’s degree (see bottom chart). Improved educational outcomes are needed all along the line: K-12 basic and vocational, training programs for the many skilled jobs going begging and also more low-cost college programs. More low-skill immigrants, not fewer, are needed to take on the expanding number of low-wage jobs, such as caring for the growing numbers of elderly, which Americans are not willing to do. Conclusion. These economic trends towards more earnings and geographical polarization could easily make our current political polarization even worse than it already is. This means it is all the more important to make sure that we keep speeding up economic growth, better address income inequality and poverty and get our gargantuan debt problem under control. 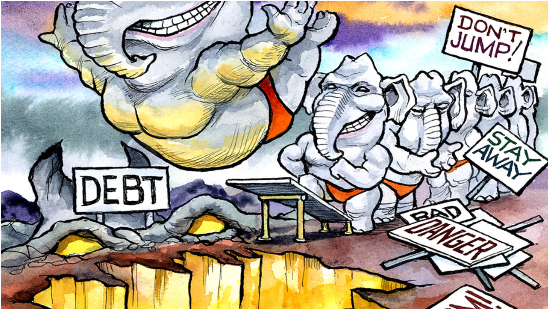 Which Is Worse: Republican Hypocrisy about Debt or Democratic Complacency about It? My recent posts about the American Idea have argued that our country has a great future before it. We have a strong and prosperous economy and are the world’s leading innovator. Furthermore there are clear cut and effective ways to address the income inequality and poverty which hold back many Americans from fully sharing the benefits of our remarkably successful society. But there is one huge problem our political system is ignoring which will lead to a major crisis if left unattended much longer. National Debt, now sitting at 77% of GDP (for the public part on which we pay interest), the largest it has been since the end of WWII. It is predicted by the Congressional Budget Office to keep steadily getting worse without major changes in current policy. Right now all of this debt is essentially “free money” because interest rates are so low. Economic growth is created by tax cuts but only 10-20% of the lost revenue from tax cuts is offset by new growth. Interest rates will return to more normal (and much higher) historical levels eventually and, when this happens, interest payments on the debt will skyrocket by hundreds of billions of dollars every year. This will crowd out all sorts of spending on popular domestic programs. It is likely to lead to a new fiscal crisis, much worse than the Financial Crisis of 2008. Conclusion. For all of our nation’s great strengths, we are in a very serious fiscal pickle, with no clear cut path of orderly resolution. Realistically our debt problem cannot be wound down without committed Presidential leadership and this is unlikely to happen anytime soon. Not only is Washington politics already hyper-partisan, but both parties are continuing to move to even greater extremes, see here and here. Single payer healthcare. The failure of the GOP effort to repeal the Affordable Care Act this past summer means that (the goal of) universal healthcare is here to stay. The ACA expands access to healthcare but does nothing to control costs. Single payer, Medicare for All, would control costs but then we end up with socialized medicine. The only way to establish a cost efficient free market healthcare system is to remove, or at least limit, the tax exemption for employer provided care and to set up high deductible catastrophic care supplemented by health savings accounts to pay for routine expenses. This would compel everyone to pay close attention to the cost of their own healthcare. Tax cuts instead of tax reform. Tax reform, i.e. lowering both corporate and individual tax rates, paid for by closing loopholes and shrinking deductions, is an excellent way to speed up economic growth and thereby create more and better paying jobs. But it is imperative to do this in a revenue neutral manner, i.e. without increasing our annual deficits. 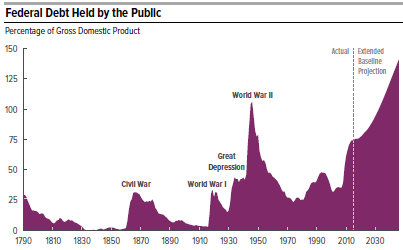 Our debt (the public part on which we pay interest) now stands at 77% of GDP, the highest it has been since the end of WWII, and is predicted by the Congressional Budget Office to keep getting larger without major changes in public policy. Conclusion. 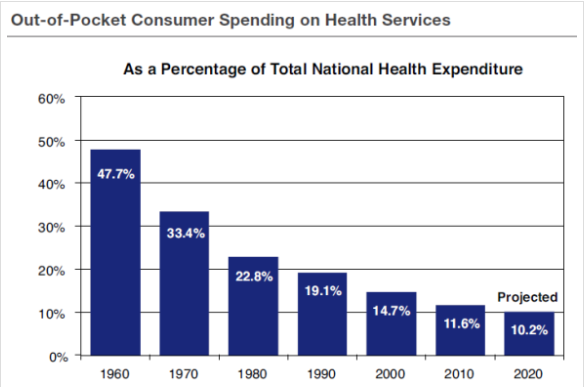 The U.S. badly needs a more cost efficient healthcare system and a simpler and more efficient tax system. But there are right ways and wrong ways to do both of these things. Single payer healthcare and (unpaid for) tax rate cuts are the wrong way to proceed. In each case, no action at all is much better than getting it wrong. The general theme of this blog is major fiscal and economic issues facing the U.S. such as slow economic growth and huge debt. 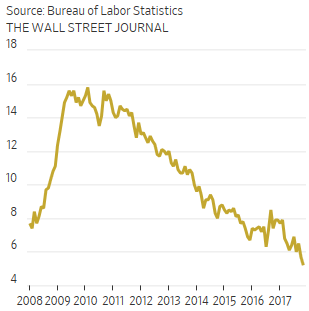 But our currently low unemployment rate of 4.4% and several trends, here and here, suggest that economic growth may already be starting to pick up. This means that our huge debt, now 77%, for the public part on which we pay interest, the highest it has been since right after WWII, is now one of the very biggest problems facing our country. The only practical way to “solve” our debt problem (so to speak) is for each year’s annual deficit to be less than economic growth for that year. When this happens, then the debt will decrease as a percentage of GDP. If this pattern were to hold year after year, then debt would continue to shrink. This is exactly what happened from 1946 until about 1980 but since then the pattern has reversed and the debt has increased. It has grown especially fast since the financial crisis in 2008 (see chart). The Fiscal Year 2017 deficit is $700 billion out of a total GDP of $20 trillion, which computes to 3.5% of GDP, well above the 2% annual growth of GDP for the 2017 FY. This means that our debt got worse in 2017. Congress has already approved $15 billion in disaster relief for Hurricane Harvey. Now the White House is asking for $29 billion more ($12.8 billion for new disaster relief, especially for Puerto Rico, and $16 billion for the National Flood Insurance Program). Congress has also approved a big increase in the Defense Budget, to $700 billion, for the 2018 FY. Congress will soon be approving a budget for 2018 and then start working on a tax reform package. Given the likely increases in both military spending and disaster relief described above, it is now even more important for the new budget to show overall spending restraint and for the tax reform package to be revenue neutral. Conclusion. Let’s hope that Congress gets the message about the new urgency of our debt problem and acts accordingly!